An analysis pass which caches information about the entire Module. Records both the function level information used by GCRoots and a cache of the 'active' gc strategy objects for the current Module. Definition at line 152 of file GCMetadata.h. List of per function info objects. In theory, Each of these may be associated with a different GC. Definition at line 166 of file GCMetadata.h. Definition at line 181 of file GCMetadata.h. Definition at line 62 of file GCMetadata.cpp. 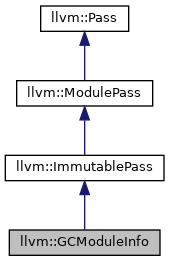 begin/end - Iterators for used strategies. Definition at line 194 of file GCMetadata.h. Referenced by llvm::AsmPrinter::doFinalization(), and llvm::AsmPrinter::emitStackMaps(). clear - Resets the pass. Any pass, which uses GCModuleInfo, should call it in doFinalization(). Definition at line 81 of file GCMetadata.cpp. References llvm::DenseMapBase< DerivedT, KeyT, ValueT, KeyInfoT, BucketT >::clear(). Definition at line 195 of file GCMetadata.h. References llvm::SmallVectorTemplateCommon< T >::end(), and F(). Definition at line 168 of file GCMetadata.h. Definition at line 169 of file GCMetadata.h. get - Look up function metadata. This is currently assumed have the side effect of initializing the associated GCStrategy. That will soon change. Definition at line 66 of file GCMetadata.cpp. References assert(), llvm::DenseMapBase< DerivedT, KeyT, ValueT, KeyInfoT, BucketT >::end(), F(), llvm::DenseMapBase< DerivedT, KeyT, ValueT, KeyInfoT, BucketT >::find(), llvm::Function::getGC(), getGCStrategy(), llvm::Function::hasGC(), I, and llvm::GlobalValue::isDeclaration(). Referenced by llvm::createGCInfoPrinter(), and INITIALIZE_PASS_BEGIN(). 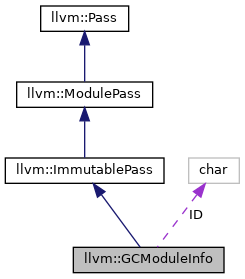 Lookup the GCStrategy object associated with the given gc name. Objects are owned internally; No caller should attempt to delete the returned objects. Definition at line 146 of file GCMetadata.cpp. References llvm::Registry< T >::begin(), llvm::Registry< T >::end(), llvm::Registry< T >::entries(), error, llvm::Entry::Name, Name, and llvm::report_fatal_error(). Definition at line 183 of file GCMetadata.h.